The developer of the Wedgwood neighborhood, Albert Balch, was born in Gem, Idaho, finished high school in Blaine, Washington, and graduated from the University of Washington in Seattle. In 1934 Balch was thirty years old, married and about to become a father, and his natural ambition and drive caused him to want to improve his status for himself and his family. In the early 1930s Balch was working as a salesman of radio advertising for Fisher Communications. He had steady employment during the insecure times of the 1930s, yet Balch’s natural boldness caused him to look for more and better opportunities. Along with co-worker Ralph Jones, the two men quit their jobs because they thought they could do better in real estate. They dared to take a big risk in the face of the “down” economic times of the Great Depression of the 1930s. 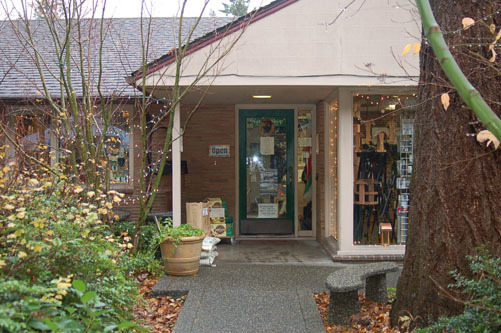 The original office of Albert Balch, developer of Wedgwood, is now the Seattle Audubon Nature Shop at 8050 35th Ave NE. Balch & Jones succeeded in developing and selling house lots in View Ridge, centered along NE 70th Street east of 35th Avenue NE. After five years’ experience Balch was ready to do even more, so in 1941 he launched out on his own to build what became the Wedgwood development. The first plat which became the original group of Wedgwood houses was on the west side of 35th Avenue NE from NE 80th to 85th Streets. As Balch acquired more land and built more sections of Wedgwood houses, in 1949 he established an office at 8050 35th Ave NE, which remained his home base for the rest of his career. This blog article will quote extensively from the recollections of Ethel Madigan, who became Balch’s secretary in 1957. Originally from Minnesota, Ethel and her husband Mel came to Seattle when Mel worked in defense industries during World War Two. Next door to Balch’s personal office at 8050 35th Ave NE (present site of Seattle Audubon) was 8044 35th Ave NE, the real estate office. Balch had bought the right to use the name Crawford & Conover, a Seattle firm which had been founded in 1888. Balch had many items, such as this ashtray, which were gifts for customers. Photo courtesy of Brian Fisse and the “from Wedgwood” Facebook page. Mel & Ethel’s children were in their teens and, with fewer home responsibilities at this stage in her life, Ethel thought she might be able to take on the challenge of working for Mr. Balch. She told Olive that she had once worked for an attorney back in Minnesota, and Olive was ecstatic. Olive talked to Mr. Balch the next day, June 6, 1957. Mr. Balch then phoned Ethel Madigan and asked her to come to the office at 8050 35th Ave NE. Ethel did so, bringing with her the letter of recommendation which she had from her former employer. Mr. Balch seemed impressed and wanted me to start work immediately. He introduced me to Neil Bannon, his office manager, and told Neil I would be working in Olive’s place at $300 per month. I found out later Neil was furious that I would be starting at the same salary Olive had been getting. I did not tell Olive that it was my birthday, June 7, on the day I started work at Mr. Balch’s office. Olive introduced me to the other employees and showed me what she could in the few hours we had together. At noon someone arrived with a beautiful cake. I thought, how could they know it was my birthday? Thank goodness, I said nothing as the cake was in honor of Olive’s five years with the firm. Ethel had not worked in an office for fifteen years and there had been changes in “technology” in that time. Computers had not yet been invented, but electric typewriters had come into general use. Ethel had never used one. I never will forget the first letter Mr. Balch dictated to me. It was a two and a half page letter to the Seattle Parks Department. I managed to take the letter down in shorthand, but typing it was another story. Electric typewriters had replaced the faithful L.C. Smith manuals I had used. The one on my worktable was a beautiful IBM Executive Electric typewriter with an 18-inch carriage. I didn’t even know how to turn it on! Finally, Neil, the office manager, brought a Smith-Corona manual typewriter to my desk. I used this for a couple weeks, but once I started using the electric typewriter, I wanted to use nothing else. Balch offices in 1962, with the Crawford & Conover real estate sign at 8040-44 35th Ave NE. Photo 76719, courtesy of Seattle Municipal Archives. Each company had its own purpose, such as for real estate, investment and insurance brokerage sales; finances and mortgages; land holding; retail and wholesale lumber sales; land development equipment; residential and commercial building; supermarket and service station owners and lessors; boat marina and apartment complex owners and managers; and payroll and office management. All the companies were intercompanied. Funds were transferred from one entity to another; real estate was sold by one to another; work was done by one for another; one company might guarantee another’s debt; stock and partnership interests in some entities were owned by others, as well as by individuals and trusts. This one borrowed from that one and perhaps both loaned to another of the companies. The intercompany business went through one company, Wedgwood Realty Co. The accounting department was well versed in handling these complicated transactions. The Seattle Audubon building (at left) was Balch’s original office as of 1949. In 1951 he built medical-dental offices next door. When Balch needed more space, he took the nearest one and designated it as the real estate office, called Crawford & Conover. Since the 1950s the original C-shaped C&C sign has been used by the current businesses. The business for all the companies was done through the office at 8050 35th Ave NE (present site of Seattle Audubon Nature Shop.) This was its main business office. Anthony Fric, an architect, and Paul Williams, an engineer, also were employed by Mr. Balch and had offices here. 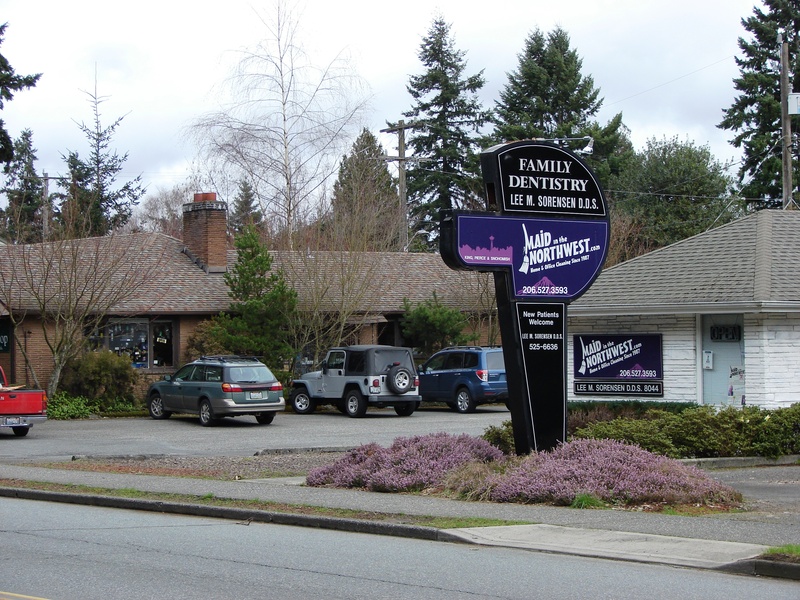 The Crawford & Conover real estate brokerage sales office was next door and across the parking lot, at 8044 35th Ave NE. An affiliate, Albert Balch Community Builders, Inc., had a brokerage sales office in Lynnwood. It and Crawford & Conover had branch sales offices in areas where subdivisions of homes were for sale, such as in Renton, in Port Townsend and in Sequim, and at 145th & Aurora in Seattle. At times, from fifty to seventy-five sales people had their associate brokerage licenses with Crawford & Conover, many having received their training through the company. One of the companies, President Park Development Co., was in the middle of a large home building program when I started working for Mr. Balch. The company had purchased from affiliates lots already platted in Seattle and King County, and raw acreage. The acreage was platted and developed into several subdivisions and into 217 residential lots. These were in the Renton area, in North Seattle and in Normandy Park, southwest of Seattle. On the already platted and newly platted lots, the company built and sold more than 180 homes, mostly between 1954 and 1960, at prices ranging from $7,900 to $14,000 in the Renton area and from $18,000 to $30,000 in the Seattle and King County areas. About 100 improved lots were sold to home builders. Although there were “satellite” offices for the building projects in different areas around Seattle and on the Olympic Peninsula, the Wedgwood office at 8050 35th Ave NE was the nerve center and was always Balch’s personal office. Ethel soon gained confidence in her work and she enjoyed the hustle and bustle of Balch’s busy office. The office was a busy place. Early in my employment, one of the fellows in the back office told me that Mr. Balch was never happier than when his people were hurrying from here to there, no matter the distance or reason. My office was directly across the hall from Mr. Balch’s, and anyone wishing to see him, saw me first. All mail and telephone calls for him came to my desk for distribution. Frequent visitors said my office was like “grand central station.” When Mr. Balch was in his office, this often was true. I liked it. There never was a dull moment. 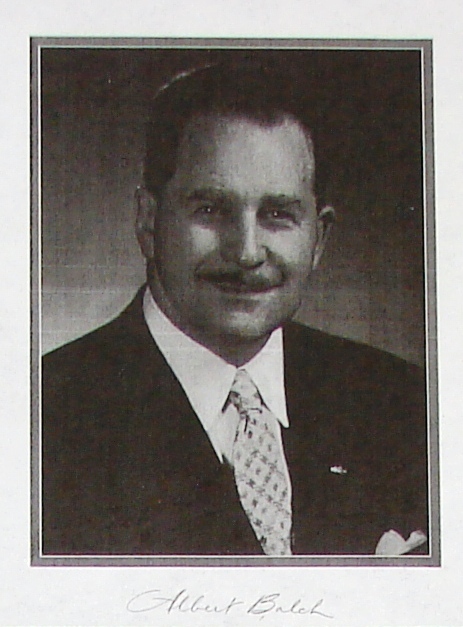 Mr. Balch made many trips to Florida, California, Arizona and other areas for development ideas. The fellows in the accounting department were great at telling stories of things that happened before my time. They told of the receptionist who answered a long distance call from Mr. Balch when he was in Jamaica. Mr. Balch made idle talk comparing the weather in Seattle to that in Jamaica, and then asked if anyone there wanted to talk to him. The receptionist looked around and since everyone was busy, she said, “No one wants to talk to you,” and hung up. 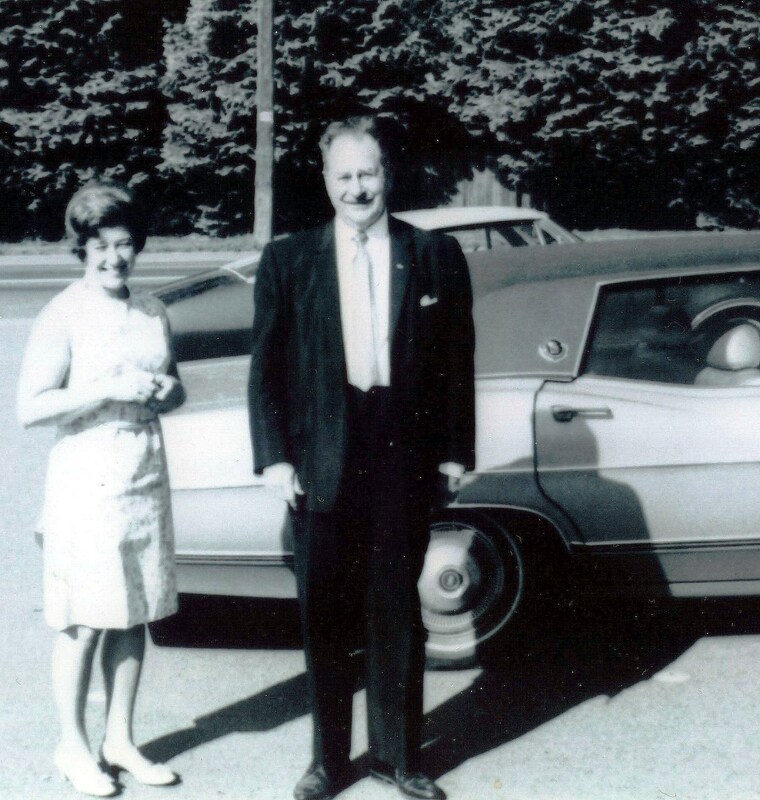 In 1957 when Ethel began working for Mr. Balch, her family had lived in Wedgwood for about eight years. Ethel had had some involvement in neighborhood groups, but when she began working she had to cut back on activities. I was a member of the Wedgwood Park Garden Club, but I found at meetings, members asked me questions about their homes, the streets, and even about company business that I could not answer, so I stopped going to the meetings. I had been going to a beauty salon in the Pay’n Save building (present site of Rite Aid) owned by First National Corporation, one of Mr. Balch’s companies. Even though my appointments were with one of the operators, the salon owner insisted on doing my hair herself, and instead of concentrating on fixing my hair, she wanted to talk about her lease and the premises. I soon found another place to have my hair done, and learned to turn a deaf ear about concerns in the neighborhood. Undated photo of Albert Balch, developer of Wedgwood, with his secretary Ethel Madigan. I have been fortunate to have had pleasant and considerate employers, and Mr. Balch was no exception. Most of the time, he was good natured and jolly. Other times he was serious. Mr. Balch always was nice to me, but I have heard him lecture the accountants from the back office. 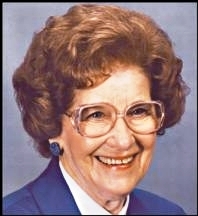 Edith, Mr. Balch’s wife, was kind and had a wonderful disposition. I admired her very much. She loved the Wedgwood pottery and fine china designed and manufactured by Josiah Wedgwood, famous English potter, and she named the Wedgwood community after him. The Balches had four children and in 1962 their son-in-law, Warren Leitch, was hired and became vice president and a director of the company. When I think of Mr. Balch, I think of him as always being a gentleman; of being courteous to everyone; of being fair in his dealings; of having a wonderful laugh; of caring about my family and of asking if he and Mrs. Balch could take my mother, Mel and me to dinner when my mother visited us from Minnesota; and of giving out business cards with humorous messages on them, as he said it was good to spread a little humor. Ethel Madigan continued to work for Mr. Balch even AFTER he died in September 1976. It took several more years to wind down the business of the company by divesting the holdings and closing all of the accounts. After a twenty-two year career from 1957 to 1979, Ethel retired with happy memories of having worked for Mr. Balch, developer of Wedgwood. In the year 2014 Wedgwood activists completed the Future of 35th Avenue NE Project, a grass-roots effort to consider the future of the commercial district of Wedgwood along 35th Avenue NE. A formal request to Seattle City Council was made in February 2015 to adjust the zoning to require storefront buildings along 35th Avenue NE. This request has never gone through and as a result, the commercial district of Wedgwood is being threatened by pressures of development. Townhouses are being built instead of the retail storefronts which are wanted by Wedgwood residents. The Balch real estate office at 8044 35th Ave NE, with the C-shaped sign in front, is due to be demolished in 2018 and replaced with ugly townhouses like the ones at the former 8038 building next door. As of January 2018 the Maid in the Northwest business moved out of 8044 35th Avenue NE. A demolition permit is on file for the building so that more ugly townhouses, like the ones next door, can be built here. This block of Wedgwood should be zoned for storefronts but Seattle City Council has never acted upon Wedgwood’s request to preserve the business district. This entry was posted in Balch, name of the neighborhood and tagged 1950's in Wedgwood, Balch real estate office, developer of the Wedgwood neighborhood in Seattle, Neighborhood History, Seattle. Bookmark the permalink.